Check out these 12 New Children's Books for Fall 2016! 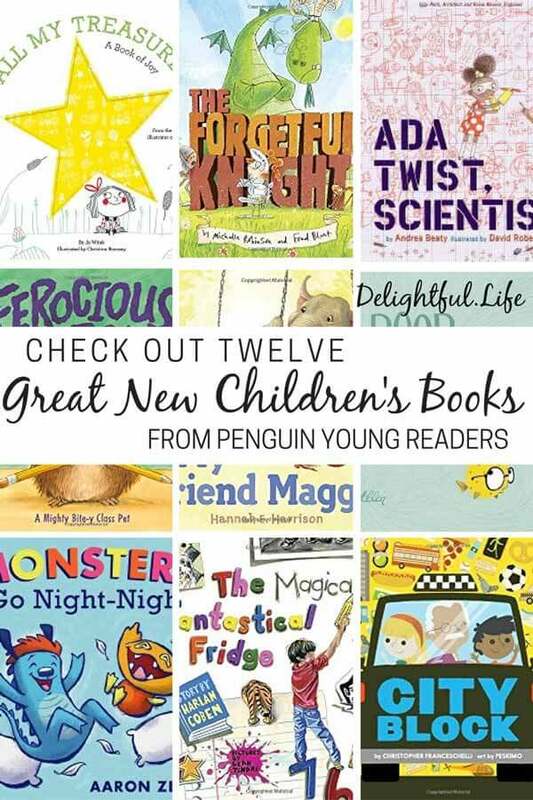 From time to time, we get to check out some of the latest books from Penguin Young Readers and Random House Kids. We have discovered some absolutely adorable books this way, and I wanted to pass along some of our favorites. Goblin Hood by Sue Fliess, illustrated by Piper Thibodeau – This book is full of adorable, candy loving creatures working hard to get ready for Halloween. This loose play on Robin Hood, with big colorful pictures and small, sweet rhymes, is a fun and easy read for fall. Goblin Hood and the gremlins of Scarewood are getting ready for Halloween. But when a witch takes all their candy, it’s up to Goblin Hood to steal from the witch and give to the poor little gremlins! Monsters Go Night-Night by Aaron Zenz – My son had a great time guessing what kind of bedtime rituals little monsters might have. For example, do you know how Little Monsters like to take baths? Hint: It’s not in water, but it does include one of our favorite desserts! Bedtime means brushing your teeth, putting on pajamas, and kissing your family good night – but little Monsters like to do things differently. Can you guess how they make bedtime so much fun? City Block by Christopher Franceschelli, art by Peskimo – This fun, interactive board book about life in the bustling big city includes pull out flaps, windows to peek through, clever cut-outs, and so much more to keep the attention of little ones. Discover ways to get around the city, fun things to do when visiting, and delicious treats to try. Kids will love the fun pages and structure of the book, and anyone with a soft spot in their heart for city markets, public transportation, local sports, food trucks, street musicians, and other things that make a city feel like home will enjoy reading this one with the kids they love. All My Treasures: A Book of Joy by Jo Witek, illustrated by Christine Roussey. We are fans of In My Heart, by the same author. All My Treasures has the same endearing illustrations, along with countless flaps to lift or peek behind. If you had a box in which you could put all of the things that bring you joy, what would it include? Today Grandma gave me a special gift, a beautiful porcelain box. I want to fill it with things that are beautiful and colorful and bright. Things that bring me joy. What if I could put all of my very favorite things inside? The Magical Fantastical Fridge by Harlan Coben, pictures by Leah Tinari. Immediately, I could tell this was going to be a fun book we’d love. From front cover to back, the pictures are unique and so engaging we couldn’t stop looking at each page long after we had finished reading the words. Admittedly, this may hold more value to those of us who grew up with fridges that were still magnetic, and covered with displays of art and family and the things we love. Still, the story was absolutely a whimsical, fun, and lovely journey for all of us! Have you ever noticed how magical your family fridge is? Neither has Walden… until now. Suddenly he finds himself transported into one of his own drawings on the rfiregerato as he begins an unforgettable adventure. He’ll battle a crayon monster, catch an airplane ride into an old photo, escape a troop of monkeys, and much more. All of the items displayed there have come alive to bring him a new understanding of his big, busy family. The Forgetful Knight by Michelle Robinson and Fred Blunt is adorable, and had my son in fits of giggles. Any parent who has a storyteller of their own will feel right at home in this adventure with a few silly twists and turns along the way! Mishaps! Mischief! Dragons! Or… what. Was it a dragon? Maybe it was a cat. An a brave knight who had a…. sandwich. A sword? Right, a sword! To fight the dragon! Or was it a cat….? With infectious rhythm, hilarious rhymes, and plenty of punch lines, this tale of boldness, bravery, pants on fire, forgotten memory, and found friends is bursting with surprises. In fact, our noble narrator may end up the most surprised of all. Poor Little Guy by Elanna Allen drew us in from the cover. What was watching this sweet bespectacled little fish? We were very surprised that the entire book has just a few (beautifully illustrated) words on each page, but still packs a punch. What do you do when you’re so tiny that the big ocean creatures think you’d even taste adorable? You keep an even bigger surprise up your sleeve. Told with wit, a wink, and a delightful sense of humor, Poor Little Guy celebrates the very smallest… and all of their giant victories. My Friend Maggie by Hannah E. Harrison. This picture book is truly a gem. Gorgeous illustrations and a heartwarming story of friendship make this one a joy to read over and over again. Simple but carefully chosen sentences make it an easy on for kids to read to you, too, and I think even grownups will find it wonderfully poignant. Paul and Maggie hav been friends forever. Paula thinks Maggie is the greatest. But when the other kids call Maggie big and clumsy, Paula’s loyalty is put to the test… until Maggie shows Paula what true friends are made of. Ada Twist, Scientist by Andrea Beaty, illustrated by David Roberts actually caught my eye in an airport bookstore. How could it not, with this adorable cover calling to any geeks or nerds (like me!) passing by? This is the third book in a series (also featuring Iggy Peck, Architect and Rosie Revere, Engineer) and I truly can’t wait to check out the others. All three of my kids were instant fans of Ada! Ada Twist’s head is full of questions. Like her classmates Iggy and Rosie, Ada has always been endlessly curious. But when her fact-finding missions and elaborate scientific experiments go too far, her frazzled parents banish her to the Thinking Chair. Will all that thinking change Ada’s mind? … With the same spirit of curiosity and perseverance as her classmates, Ada is sure to inspire young readers to pursue their own passions. Ferocious Fluffity by Erica S. Perl, pictures by Henry Cole. Another fun picture book with rhyming verses, Ferocious Fluffity is quite entertaining, as we watched this tiny little hamster wreak havoc in the building when the class fails to follow the rules. The kids learn their lesson, but will they remember for their next class pet…? The kids in classroom 2D are excited about their new class pet. Fluffity appears to be a cute and cuddly hamster – that is, until she’s let out of her cage. Suddenly, Fluffity is ready to CHOMP, and she chases students around the classroom, down the hallway, and even into the library. Can a class of second graders learn how to tame this ferocious beast and restore peace to their school? Ada’s Ideas: The Story of Ada Lovelace, the World’s First Computer Programmer by Fiona Robinson. We found this picture book biography really unique. The pictures are lovely, but at times the narrative seemed to fall a little flat by comparison. Still, I love the idea of more biographies done like this, and we all learned something new about an impressive woman. If you’re looking for more kid-friendly biographies, we absolutely love the “Who Was…” series and the “I am… (Ordinary People Change the World)” series. Finally, as a read-aloud book or a pick for even bigger kids, check out The Secrets to Ruling School: Class Election, by Neil Swaab. This book contains a really interesting mix of comics and narrative and was written for “middle schoolers in the trenches”. It’s class election time at William H. Taft Middle School, and the competition is fierce. But don’t worry – you’ve got a killer campaign manager on your side!… In just one week, you’ll be topping the polls and calling the shots. Sure, there may be some risk involved, but don’t worry! It’s nothing a smooth politician like you can’t handle. What about your family? Have you read any great new books this school year? I’d love to hear your recommendations in the comments below! Previous Post: « I Have a Fancy New Amazon Influencer Page! We love getting new books in this house and I’m always looking for new suggestions. Thanks for sharing your favorites. They look super cute!